Infoparks.com was among the privileged few that got a chance to tour the Walt Disney Studios before the March 16 opening. And being the generous people that we are, we've decided to share the scoop. 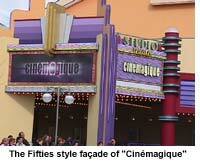 Our first impressions of these famous studios led to three general conclusions. First up, the idea to take us behind the scenes of the movie and television world was nothing short of a success. Secondly, the attractions last much longer than those at other parks. And to boot, these attractions are often in the form of shows with a good portion that is live. Let's follow the guide! One enters the Walt Disney Studios through Studio 1, a large building with shops and restaurants that immediately sets the tone: over here, illusions and artifice are the order of the day: "You are going to discover what happens behind our screens" it all seems to be announcing. And so what exactly goes on behind our TV screens? The Television Production Tour is an answer to this nagging question: the Disney Channel has installed a set for the live broadcast of Zapping Zone. Visitors have access to the part that viewers see on their screens as well as to what goes on behind the scenes on the set. One can see the production department at work and observe, for example, processes like the superimposition of an image on a blue screen. 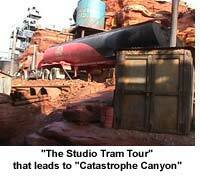 We then leave on board a small train from the Studio Tram Tour station into a world of illusion. The first stop is the abyss of a canyon smack in the middle of the filming of a spectacular earthquake. Next, we go to a London devastated by some cataclysm, surrounded by parts of sets from different films...It all seems more real than reality itself! Except that here, the visitor is allowed to see the complex machinery that creates this illusion: more fake than artifice itself. At the risk of bursting some bubbles, we have to reveal the painful reality: the spaceships that transport the heroes in Sci Fi films? Well, they are well and truly fake! For those still in doubt, take a trip to the Armageddon attraction that gives the illusion of lowering Captain Kirk and Ian Solo to the rank of bumper car chauffeurs. As we said earlier, one of the strong points of the Studios is the duration of the shows and the fact that a good portion of them is live. If we were to create a coefficient of satisfaction based on the time spent waiting in line and the duration of the show, rest assured that it would be quite high. Two examples should suffice to illustrate this point: Moteurs...Actions and Art of Disney Animation. Here again, visitors have access to what goes on behind the scenes. 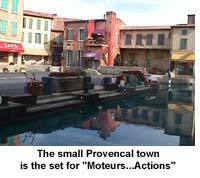 Moteurs...Actions! is a small Provencal town (a faithful cardboard replica of Villfranche-sur-Mer) with dingoes in cars, motorcycles and jet-skis that, under R�my Julienne's guidance, indulge in high-flying stunts. The 3500-seat auditorium is the largest in the Disney complex: yet one more proof that we are not here for just any old show. As the title indicates, The Art of Disney Animation is devoted to animated film. It is divided into four rooms, offering the public a glimpse into the world of cartoons that has been Disney's hallmark. As one looks at the oldest forms of animation, one discovers that animated film has been around even before movies. And even though Disney is not the one who created animated film, he is nonetheless responsible for putting feeling into those little crayoned characters. A judicious montage of the most famous feature length cartoons from Disney is shown to convince the sceptical. But in order to move the audience, the choice of characters is most important. That is, anyhow, how a cartoonist in his workshop, engaged in a hilarious dialogue with one of his creations (the dragon in Mulan), explains things in the third part of our tour. The fourth and last room of this attraction is also the most interactive: we learn to draw characters and record sound effects. We've saved the best, or at least our favourites, for last. First of all, the Rock'n'Roller Coaster: this attraction, as suggested by its title, is closer to the world of Rock music than to that of film. It is also the only attraction (along with Les Tapis Volants(The Flying Carpets) for kids) to fall into the ride category. It is, in fact, a very good roller coaster ride. One begins the wait in a recording studio where the rock group Aerosmith is recording, to arrive just before boarding the ride, in a room with the ambiance of trashy nightclub or warehouse concert hall. The cars start at top speed-and that is one of the most exciting features of this ride-and travel the crazy rails complete with loops and tailspins at the speed of a hard-rocker's riff. But our personal favourite remains Cin�magique. Those behind the concept for this attraction have succeeded, in a manner that is spectacular and not without poetry, in capturing the fluid frontiers between cinematic fiction and reality. If one were to designate an inspiration for the idea behind Cin�magique it would undoubtedly be Woody Allen. Indeed, Cin�magique seems to echo the idea behind The Purple Rose of Cairo: an actor is literally jumps out of the screen and joins the audience, blurring the distinction between fiction and reality. But we don't want to reveal too much and spoil the surprise. Suffice it to say that the montage takes you on a fabulous voyage across the history and genres of film, from M�li�s to James Cameron, from romance expressionism to film catastrophe. A nod to the country hosting the park, French film is also present in this evocation of the Seventh Art: Mickey and his friends haven't forgotten that they've moved to the country of the Lumi�re Brothers.